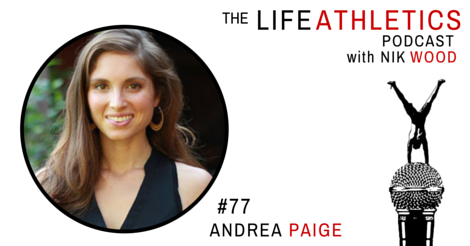 Name: 77 Andréa Paige Life Athletes, hello and welcome to episode 77 of the Life Athletics Podcast! Today’s guest Life Athlete is Andréa Paige. Andréa is a Bali-Based Naturopath, redefining health as living with maximum vitality. With depth, fire, unconditional presence and an unwavering commitment to life, Andréa takes life on with her whole self. From astrology, to nutrition, to living our maximum potential, this yoga teaching health-guru takes us for a wild ride! Habit of Action: Breathing into the centre of my chest. Into my heart. Greatest area of strength: My purpose in this lifetime is my voice. I communicate clearly and logically. Remove yourself from yourself and see the bigger picture.